Located two blocks North West from the CTA State/Lake L Station. Intimate dining area & outdoor dining space along the river. NOW ACCEPTING SPRING 2019 RIVER DOME RESERVATIONS! 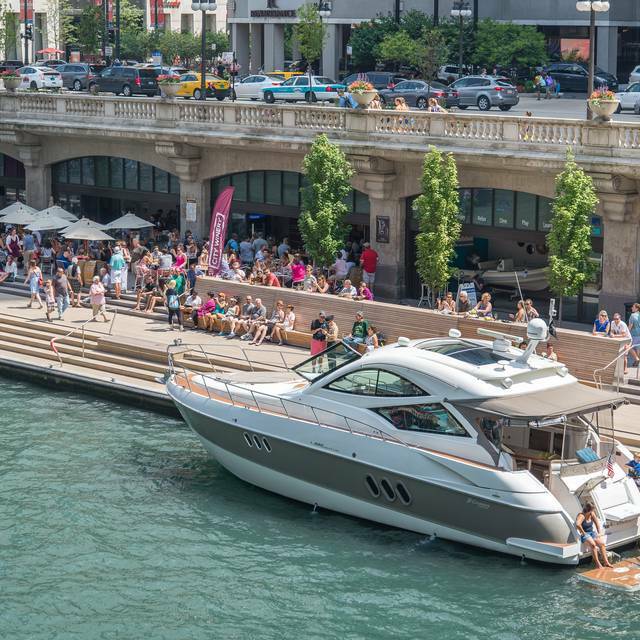 River Dome reservations accommodate groups of 2 - 8 and provide you & your guests 2.5 hours in this intimate, climate controlled, one-of-a-kind setting along the Chicago Riverwalk. All dome reservations are approximately $85/guest - including a $25 non-refundable rental fee per person, and a $60 food and beverage minimum spend per guest. Please note: all river dome guests must be 21 or older. We are, unfortunately, unable to accept reservations outside of our river domes at this time. Please note that all other space is available on a first-come-first-served basis. The food was below mediocre. 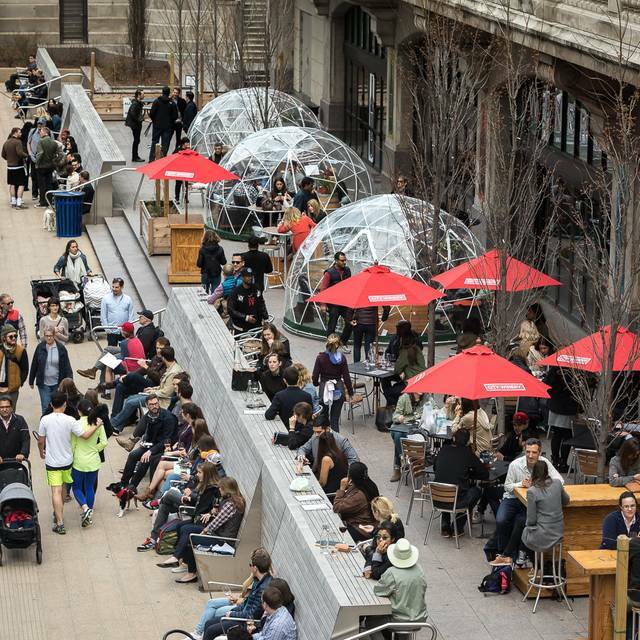 It’s over priced and not worth the price to have a meal in a heated dome. It’s a D+. This was the perfect place for a date. Our server was very friendly; the dome was cute and private while allowing you to people watch. The food was ok but the drinks were really good. All in all I would definitely return! This was such a unique experience. You have a private experience with all of the restaurant perks. We absolutely loved our lunch in the dome. A few minutes after we arrived it began to hail. It was magical being in a warm cozy spot amidst all the hail. Service was excellent and the dome had everything we needed. Blankets, pillows, everything for eating, even a speaker to hook up for music. We will return! The ambiance was great. I love the idea of sitting in a bubble with a glass of wine and my own music. The service was slow and the menu items (of which we tried several) were not very good at all... Don't go there for the food. The experience was great. But the food wasn’t. It was expensive and we expected more from the food. The potato soup did not taste good. The paté was very strong and not good. But the place is good and clean. The actual size of these globes are so small they should never say it fits 8 people. It was laughable. It was a nice experience, but to dine in a definite no the food portions were small for the bucks not much food options to choose from and furniture was not comfortable some seats were broken. A group of 7 of us got together for a birthday celebration. The service was phenomenal and extremely attentive. The igloo we were in was a little tight for 7 folks and the shareable platters were pretty standard. It was an experience and no real complaints! 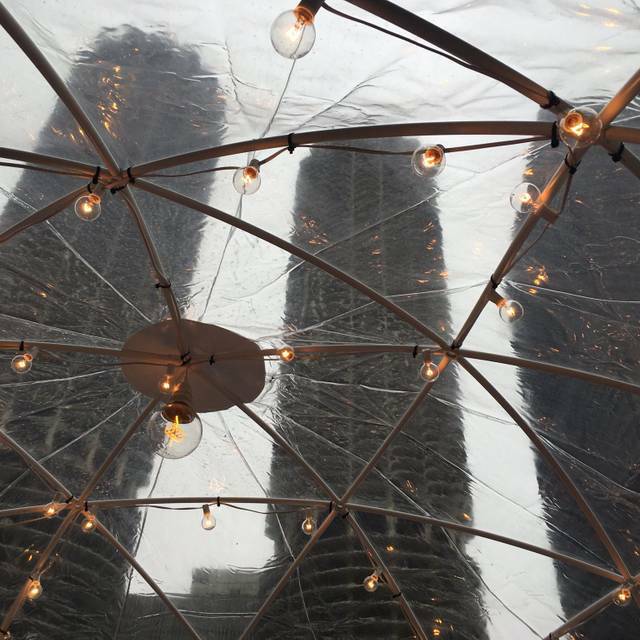 We had a 4:30pm dome rental at City Winery Chicago. The menu was limited and we were disappointed in the service. There is a $25 per person per dome fee and a $60 minimum charge per person for our two hour rental. So right out of the gate our bill was $340. Please double check the menu... our menu was different than the one on open table and was limited. Cassidy was helpful in resolving some issues and we felt like she really cared. She represents City Winery very well. The best part was the river view. You can also enjoy drinks next to the heater at the outside bar, have a nice time and save a ton of money! We had dinner in one of the domes. It was great but it was too pricey! I think the $25 per person plus a $60 per person minimum is too much! We had a wonderful time enjoying a dome at the Riverwalk!! The food was excellent, and the staff members were friendly and efficient. I would definitely recommend this experience! A very enjoyable afternoon on the river. Good food, great service and terrific wine. We will be back. Me and my girlfriends came here for our annual Christmas party together. We had a reservation for 7:30 and once we got there I was a little confused on where to go but a gentleman showed us to our igloo. The minute we entered it reeked of marijuana (smoke) and the little windows were open to ventilate the smoke out I’m guessing. Then we proceeded to sit there and wait until 8 o clock when our server finally arrived saying that we needed to bear with him because he had 15 igloos he was taking care of and he was running back and forth and once we asked about the smoke smell, he stated that someone from off the river came up into the igloo and was smoking inside? Mind you, we have to pay a $25/person reservation fee for the igloo. Why would you ever say that to a customer?After all that, we ordered starters and a large bottle of wine. Our starters came and the bottle of wine. Fast forward about another 45 minutes and he still didn’t come back, mind you we had a minimum spending amount we had to reach and weren’t even close to that at this point. Finally he comes and we order basically everything else we wanted for the night because we were only slotted 2.5 hours. The rest of the food gets brought back and then about 10 minutes later our waiter comes in with the bill and says we need to “wrap up” because our time is ending. WE JUST GOT OUR FOOD TEN MINUTES AGO. I confirm that we had 2.5 hours reserved and that our reservation started at 7:30 and he didn’t come in until 8pm for us to order anything at all. He gets flustered and then says that I am correct. I asked him if we had met the minimum and he said yes you spent $254 just a little above our minimum but then when he left the bill it’s was $407! Honestly, the worst dining experience I’ve ever had in my life. I can’t believe we actually had to pay a $25 rental fee per person for that. None of us will ever go back there again. I wouldn’t recommend this experience to anyone. We had so much fun in the dome! The service was great and the food was delicious. We loved our afternoon in the City Winery Dome! 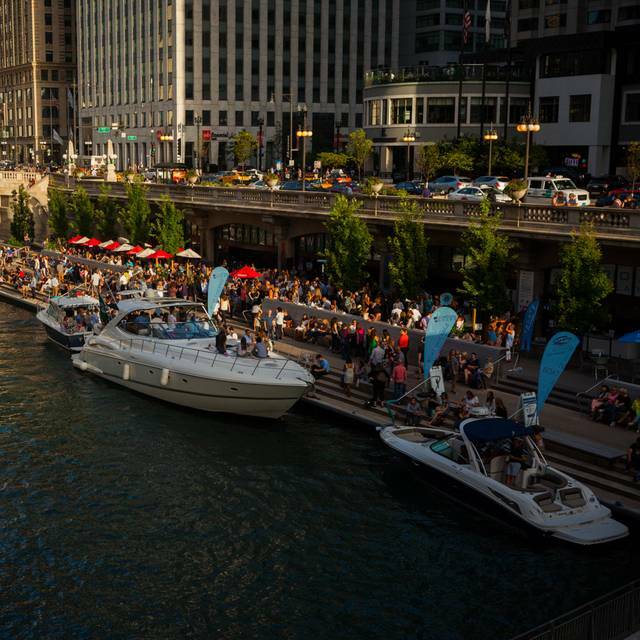 With views of Marina City and the river, our Dome provided the perfect Riverwalk experience - in December! The food and wine were delicious. A service hiccup was handled graciously and generously and included a personal apology from the manager. Our group of 6 can’t wait to return. 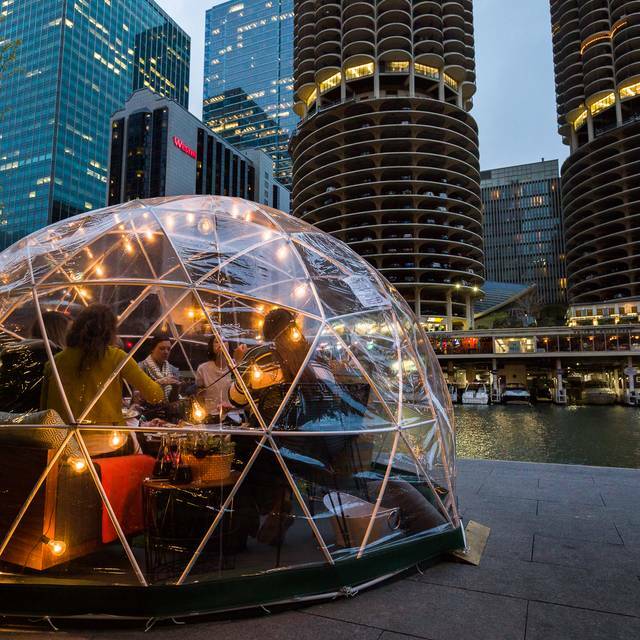 The City Winery dome was fun to do once, but I doubt I would do it again because of the price. The service was very good however - you get a couple glasses of something as soon as you walk in, and they check on you a lot. They even provide new socks so you can walk around without your shoes. Had lunch at the Riverwalk domes in the winter time. Loved how it was set up! Very nice experience! You have to order a lot of things to meet your $60 minimum per person so keep that in mind! We ordered lots of food! very fun. we sat in one of the igloos. an excellent place for day drinking! The service was great!! The food menu was limited. The alcohol menu was plentiful. The prices for the food and drinks were reasonable. I didn't like the $25 per person reservation fee for the domes, although I do understand why they had them. The face that we were required to spend $60 per person while we dined in the dome made this cost prohibitive for me. The price for two of us to eat ended up being $175 before the tip. I find that to be exorbitant. It was a lovely experience that I wouldn't do again because of the price. Reservation for 1230. Had to wait to get seated, but our reservation time didn’t get extended on the back end. When you’re paying for 2.5 hours that’s what I expect to get. The ambiance was of course lovely. Service a bit slow. Food was good. Unique way to get outside in the middle of winter. Price reasonable. I don’t write many reviews on here......but I felt that there were enough poor ones I had to. 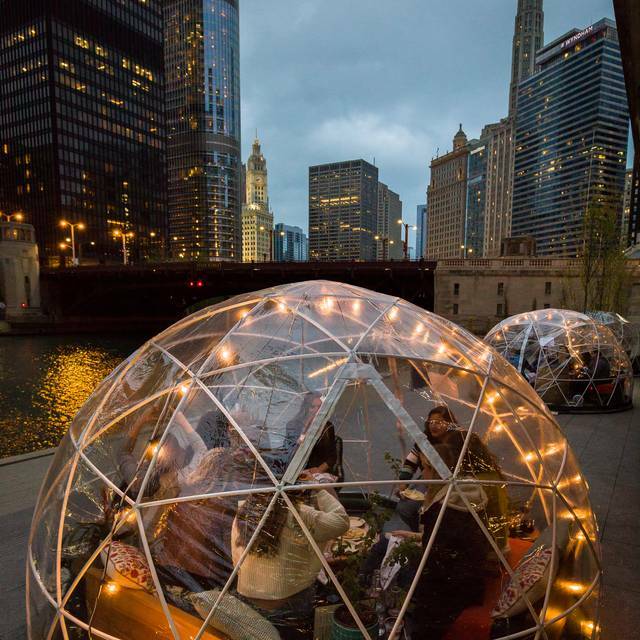 This bubble/dome is a cool and different way to head out with friends and drink wine/eat, do whatever. If you’re looking for the most economical way to do this, obviously don’t go here. But as a riverfront adventure....sure! They could charge a fee per dome instead of per person in my opinion. We had good wine and apps, very nice server. We stayed warm the whole time w 2 space heaters except our feet towards the end. Play cards, play music, all acceptable. So wear some uggs or put on the provided extra socks. Great views from the igloo and it was beautiful to watch the sunset. Although the food was just okay, the wine list and ambiance are to die for. Would recommend. We had an excellent time sitting in the bubble at City Winery on the Riverfront. There were 4 of us and we really enjoyed the whole experience. It was warm enough even in the December cold. There are games and blue tooth speakers available to keep you entertained in between the food and drinks. There aren't that many food options but we just wanted appetizers and drinks so we were plenty satisfied with the options and quality of the food. Would highly recommend it for a special occasion or fun evening out with friends. We booked a dome, and it was such a unique experience. The dome was well insulated, and quite warm and gave us a nice view of the city. Service and drinks were great! 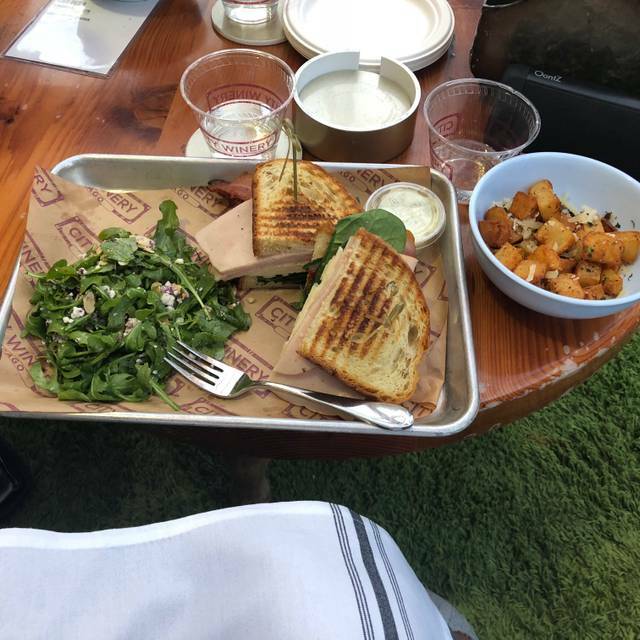 Food was good, but nothing special. It was a fun time and I would recommend to anyone looking for a different experience for drinks and socializing with friends! 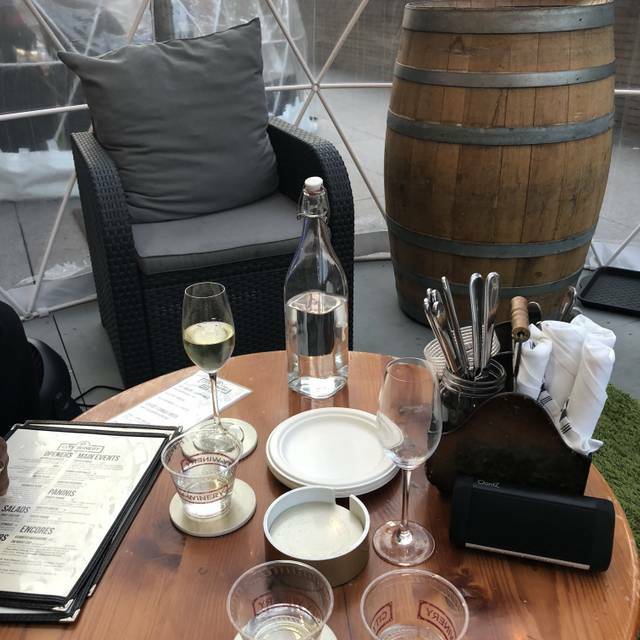 I have been wanting to take advantage of the City Winery Domes for awhile, and was thrilled to get a reservation. The food was pretty good, and the atmosphere is obviously great. However it is very expensive once you take into account the reservation fee and the food minimum. Certainly worth it for the experience, but you're going to spend a lot. In addition, the domes are nice- with blankets, bluetooth, and heaters, but they are not well insulated. My friends and I were actually really cold. The food in the dome was surprisingly poor and not warm for the amount of money we spent. The dessert was a joke. Osiris is amazing and so personable, made our DOME experience extra special and entertaining. Atmosphere was up to par and food quality exceptional. We love the concept of the domes, warm enough, plenty of room for8, fun. We enjoyed the food, drinks, playing cards. Our waiter started out good, but then seemed to be annoyed & short with us. Did we ask too many questions?! When we were ready to wrap things up, we were then told we still had credit available. We were offered to take food to go. Why didn't someone ask us earlier how we were doing & let us know that we still had credit to use?! The only other problem was because of a the rain, the carpet was wet. Loved the idea of the socks, but didn't want our feet wet! About half of us said we would do it again, the others said it was fun, but probably a one time deal due to cost. The ambiance was great but the food wasn’t good. Both of our entrees were cold. My husband ordered the pork chop which was super dry and I ordered the sea bass. I ended having to remove multiple pin bones as I was trying to eat my dinner. $10 for the s’mores dessert was ridiculous, it definitely wasn’t worth the money and looked like it was thrown on a plate. The domes were fun and I’m glad we went but not sure the money for the food was worth it. Kind of disappointed, not sure we’ll be back. Me and my wife had a great time. Service was great, cheese platter and food was fantastic. Great wine and setting! Loved the board games as well. Definitely will recommend to others and do again next year! Had to try one of the domes. The experience was very cool and one of a kind. The service was good. Unfortunately the food was underwhelming both in variety and taste. The menu was very, very limited. Cocktails were just ok. Come for the cool experience but don’t expect much beyond that. But i will go again. We were 4 couples in a River Dome and we had an amazing time! So nice to be in a warm bubble on the river on a cold day! Great experience. A must do! Everything was wonderful! We had the best time. Our server Nick was helpful and attentive. He made ordering easy, and had things cut so they were very shareable. Will definitely do it again! This review is an update from one posted Nov. 2018. First and foremost, I must mention Cassidy Fletcher, Service Director. She immediately responded to my review and encouraged my friends & I to give The Domes another try as she would diligently work to make the next visit more enjoyable. And did she deliver! 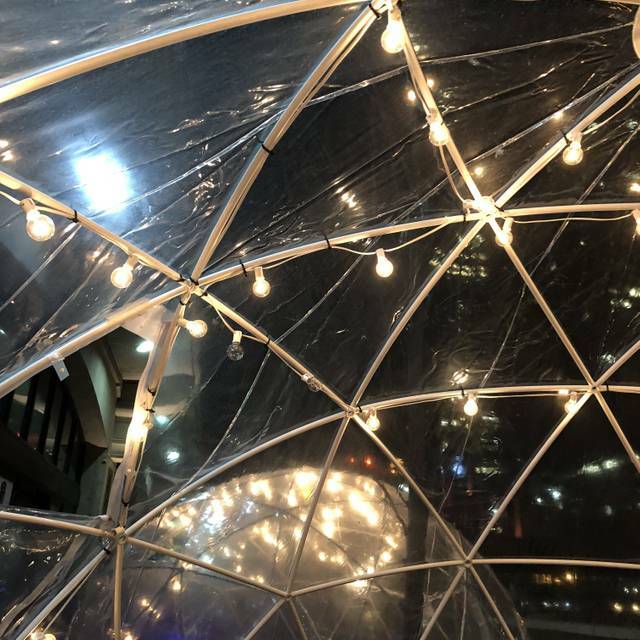 We walked into a cozy, well lit, tastefully decorated, sufficiently heated Dome, add games, blue tooth speaker and the incredible city views to round out the pleasant ambiance. Cassidy personally visited us to confirm we were comfortable & content. What a rare person who actually cares and responds that thoroughly! Nick, our server, was attentive and very knowledgeable. The olive tampenade in The Schmear Plate was a salty delight when spread on scrumptious rosemary crackers. The Cheese Panini blend of cheddar, apple butter & sun dried tomato tasted amazing. The City Winery Pinot Noir Reserve was so smooth and delightful. But the star of the evening was Cassidy. She listens, she cares, she fixes! What more would I want from any business. Kudos to City Winery for hiring such an exemplary employee. Don't go to the Igloos here. Not warm enough and furniture not comfy. Our server Osirus was awesome, both him and Christian made our experience. The food was great, though I would have preferred a few more options. As far as Value, you are paying for the experience. It was fun to do once, but I wouldn't spend that again.